"These are absolutely divine!! I am always asked to bring these for our school's bake sale and they are always the first to go! If there are any leftovers (which is doubtful) I prefer to keep the in the refrigerator." Place brownie mix into a mixing bowl and stir in vegetable oil, water, and eggs; beat 50 strokes with a spoon. Spread the batter into the prepared baking dish. Bake brownies in the preheated oven until a toothpick inserted into the center comes out with moist crumbs, 25 to 30 minutes. Check after 25 minutes. Let the brownies cool while you complete remaining steps. 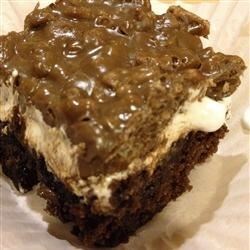 Spread marshmallow creme over the warm brownies. Place milk chocolate chips and peanut butter in a large saucepan over low heat and stir until the mixture is warm, completely melted, and smoothly combined. Stir in the crispy rice cereal until thoroughly coated and spread over the marshmallow creme layer, pressing and filling any voids. Refrigerate until set, 20 to 30 minutes. Cut into bars to serve. The brownie that’s marshmallowy good! Very good! I brought these to a potluck at work and the plate was clean in no time at all. Love the crispiness with the softness of the brownie. This is the second time making these. They are so yummy. I wouldn't change anything. Love the krispy chocolate peanut butter goodness on top! Supper easy yummy treat!